The Tamimi clan has become internationally renowned, thanks in part to the support of Amnesty International. But their supposed advocacy of non-violence is a dangerous myth; all along, they’ve been working for a third intifada. Ever since the outbreak of the second Palestinian intifada, or uprising, in September 2000, a cluster of international human rights groups have established a standard template in response to Israeli claims about Palestinian violence directed against the citizens of the Jewish state. Whereas the Israelis place the accent on the eliminationist goals that underpin the violence—attacking Jews for the sole reason that they are Jews, with no legitimate claim to sovereignty in the land—much of the global human rights community has responded with scorn, arguing that the violence is the direct result of occupation and settlement building, that the Palestinians have the right to “resist” with all available means at their disposal, that poverty, lack of opportunity and the continuing denial of statehood are the primary causes of Palestinian anger, and that any Israeli use of force is by definition both lethal and disproportionate. These themes have been continually emphasized during periods of crisis, from the three wars in Gaza over the last seven years to the present wave of stabbings that have targeted Israelis across the country. Organizations like Amnesty International have seized on these paroxysms of Palestinian violence to implore the governments around the world to do more to punish Israel. At the same time, no human rights group wants to be regarded as simply parroting the claims of Palestinian officials, whether from the Palestinian Authority in the West Bank or the Hamas regime which still rules with an iron fist in Gaza. That’s why it helps to have partners who can be depicted as authentic representatives of Palestinian “civil society,” beholden only to their people, and therefore speaking with proud, uncompromised voices. That too many of these same voices engage in vile anti-Semitic rhetoric in their pleas for more stabbings against Israelis is an inconvenient truth which Palestine solidarity activists prefer to ignore. 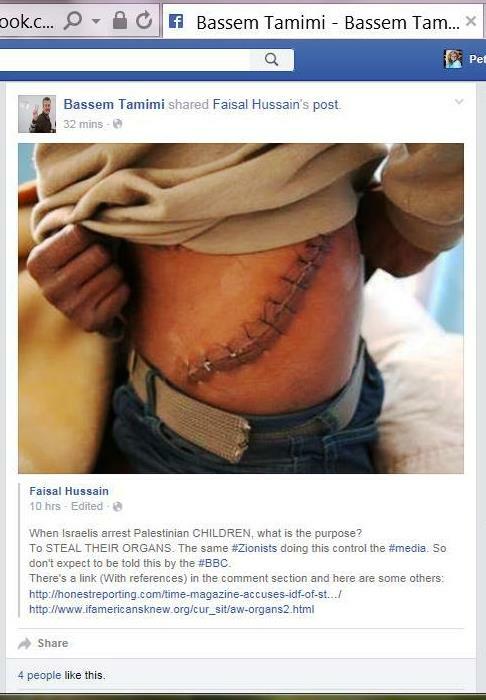 As far as they are concerned, Palestinian incitement—even when it extends to repeating the medieval “blood libel” against the Jews on social media or in mosque sermons—is a mere phantom. The occupation, by contrast, is held up as a brutal daily reality. Which brings us to the small village of Nabi Saleh near Ramallah in the West Bank. Nabi Saleh is a popular destination for international activists who want to experience Palestinian “resistance” up close. Clashes with the IDF are almost guaranteed during the weekly protests that have been held in the village for the past five years, and there are always professional photographers on hand who can be relied on to produce compelling images of Palestinian Davids challenging the Israeli Goliath. Some of the video footage shot during the protests has gone viral and resulted in global media coverage for the main organizers of the protests, Bassem Tamimi and his family. Thanks to all this attention, the Tamimis have become the poster children of Palestinian civil society, promoted by Palestine solidarity activists abroad as exemplifying the grassroots, popular nature of the Palestinian struggle. Nothing better symbolized this status than the 2013 New York Times Magazine article about the Tamimis, written by a journalist who spent three weeks living in Bassem’s house. All of Bassem’s quotes in the article—”We see stones as our message,” he declared to Israelis, before chiding the Palestinian elite for its extravagant lifestyle (“I didn’t lose my sister and my cousin and part of my life for the sons of the ministers to drive expensive cars”)—reinforced the image of him as the figurehead of a classic struggle for civil rights. While almost everyone in Nabi Saleh is a member of the Tamimi clan, Bassem’s photogenic family—particularly his teenage daughter Ahed—has always been at the center of the media attention that the Nabi Saleh protests have assiduously cultivated. In 2013, Ahed made global headlines when she was bestowed with Turkey’s Handala Award for Courage by then-Prime Minister Recep Tayyip Erdogan, in recognition of her very public confrontation with Israeli security forces who had arrested her brother. Bassem has long-served as the spokesman for Nabi Saleh’s supposedly non-violent protest movement. In an interview published in early May 2011 on the website The Electronic Intifada and promptly cross-posted at the website of the Hamas-affiliated al-Qassam Brigades, Bassem Tamimi outlined views he has since repeated many times. A quote from the interview—“our destiny is to resist”—has become something of a signature slogan for the Tamimis. Bassem Tamimi had already expressed his hope in his Electronic Intifada interview that the regular protests in Nabi Saleh would provide “the basis for the third intifada.” Some two years later, a glowing tribute to the Tamimis featured as a New York Times Magazine cover story. In that piece, Tamimi declared: “If there is a third intifada … we want to be the ones who started it.” The hope that the almost weekly demonstrations at Nabi Saleh “could become something big”—“Like a third intifada”—has also been expressed by other members of the Tamimi family. Many of the organizations that sponsored Bassem’s cross-country tour during September and October are outspoken advocates of a boycott of Israel, among them Jewish Voice for Peace; Sabeel, a Palestinian-Christian organization that attacks Judaism with Islamist zeal; Students for Justice in Palestine; and the Middle East Children’s Alliance. The most prominent of all, and certainly the most recognizable, was that of Amnesty International. Amnesty International’s unwavering commitment to the Tamimis and Nabi Saleh was reaffirmed in September 2015, when its representative for “Israel and the Occupied Palestinian Territories” rejected criticism voiced during Bassem Tamimi’s U.S. tour, adding that the organization had “adopted his village of Nabi Saleh as a community-at-risk” and that “AI groups globally work on behalf of the village long term.” In that regard, it’s worth noting that Tamimi’s tour brought his anti-Semitic views under the spotlight through a Facebook post he shared endorsing the latest version of the blood libel, which holds that Israel kidnaps Palestinian children to steal their organs in a conspiracy controlled by the “Zionist media.” In response, Jonathan Greenblatt, National Director of the Anti-Defamation League, slammed Amnesty. “Shame on Bassem Tamimi and shame on Amnesty International for supporting him while he spreads the anti-Semitic blood libel on Facebook,” Greenblatt declared. Even so, these unequivocal endorsements by Amnesty International will convince many genuine human rights activists that the Tamimis deserve uncritical support. But the carefully nurtured image of the Tamimis as activists dedicated to promoting a peaceful popular uprising crumbles quickly if one examines their statements cited in published interviews and reports, as well as their publicly accessible social media activity. The Tamimis are not fighting to end to Israel’s occupation of the West Bank, but to end Israel’s existence as a Jewish state; they harbor intense anti-Semitism and openly support terrorism. While Amnesty wholeheartedly supports the Tamimis’ “tiny village on a small hill,” the Tamimis have enthusiastically embraced the recent wave of Palestinian terror attacks against Israelis as the “third intifada” they have hoped and worked for so long. The Tamimis have never made a secret of their conviction that the Palestinians have “the right to armed resistance,” and they have consistently refused “to forswear bloodshed” or condemn terrorism. Indeed, Tamimi family members who have shed blood “remain much-loved” in Nabi Saleh—including Ahlam Tamimi, the unrepentant mastermind of the 2001 Sbarro pizzeria bombing in Jerusalem that killed 15 civilians, including seven children and a pregnant woman, and wounded 130 other people. 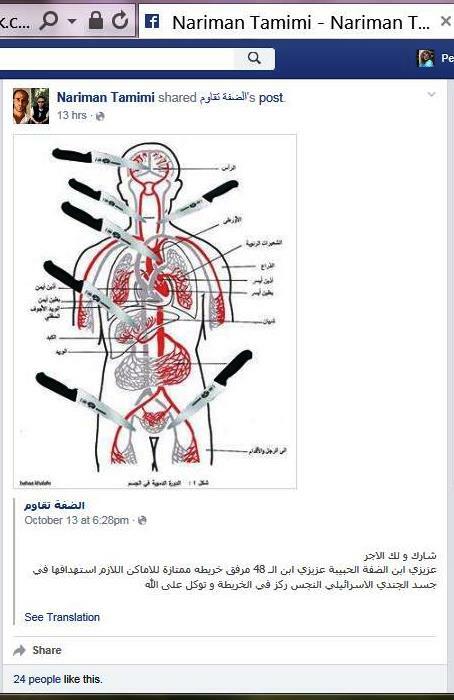 One of the most disturbing examples of Ahlam’s continuing popularity was provided recently when Bassem Tamimi’s wife, Nariman—who has also been prominently championed by Amnesty—“liked” and shared Facebook posts from a “friend” who goes by an Arabic pseudonym that translates to “Princess of the Free.” Both the profile picture and the cover picture displayed by the “Princess of the Free” at the time of this writing show Izz al-Din Shuheil al-Masri, the terrorist who exploded himself in the crowded pizzeria. 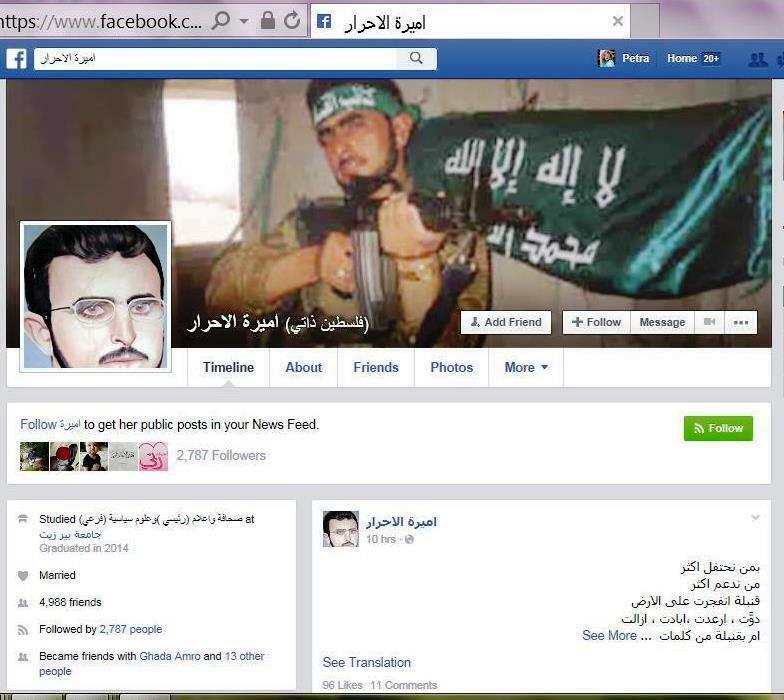 Many of this Facebook user’s posts indicate that the Princess of the Free is likely Ahlam Tamimi, who now lives in Jordan following her release as part of the 2011 prisoner exchange with Hamas for the captured Israeli soldier Gilad Shalit, where she presents a television show on a Hamas-affiliated television station. Fire was lit in the body / Don’t just stand by perplexed / Remember the day the restaurant burned / Remember the day that the roof flew away / What prevents honor from returning? / What prevents the rebels from laughing? / Try and move forward / Try and plan / Try and carry out / Prepare the mix / Take the axe / What’s the plan? / Believe me, with your hands only / You will cause a heart attack for the enemy. 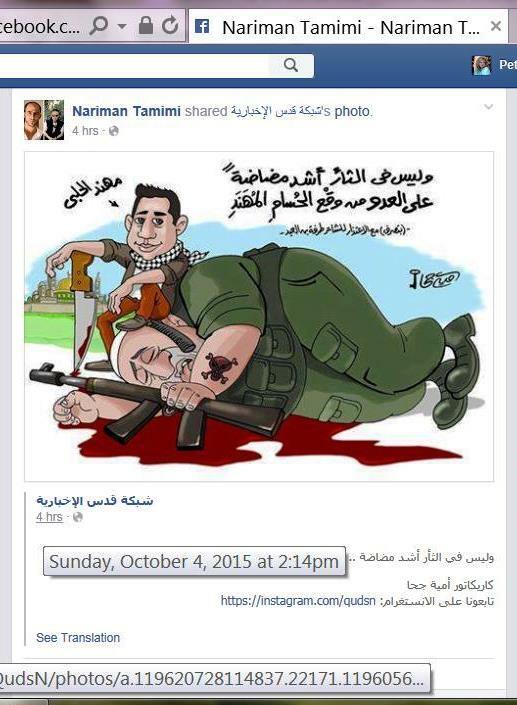 Some two weeks later, Nariman Tamimi shared a post in which the Princess of the Free provided a blueprint for the wave of ostensibly unorganized “lone wolf” terror attacks that started to spread across Israel in early October 2015. It seems the Tamimis were simply being honest when they consistently refused to distance themselves from their murderous relative and to denounce terrorism: Bassem Tamimi, his wife Nariman, and their daughter Ahed, as well as Bilal and Manal Tamimi, who are part of the Tamimi media team, are all Facebook friends of the Princess of the Free. Given the probability that this Facebook denizen is in fact Ahlam Tamimi herself, it is also noteworthy that on August 26, Nariman Tamimi shared a Facebook post rejecting the “Zionist” designation of the Sbarro massacre mastermind and three other notorious female terrorists as such, and insisting that the four women should instead be described as “rebels.” Together these “rebels” killed more than 50 Israeli civilians—including many children—and wounded hundreds. With the escalation of terror attacks in the course of October, Manal Tamimi’s Twitter stream turned into a dismal reflection of the incitement spread in Palestinian media and social networks, with countless tweets praising the perpetrators of attacks and calling for more violence. 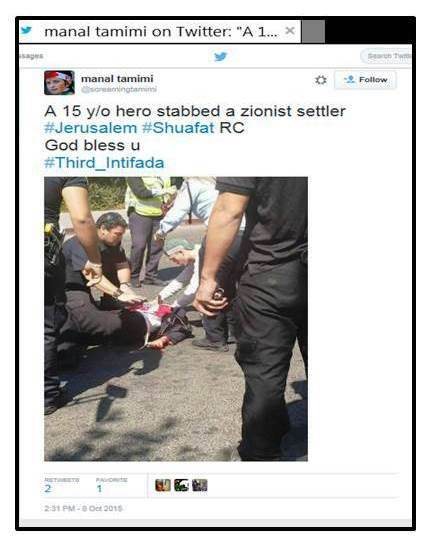 Given the fact that the Tamimis have promoted a “third intifada” for years, they must have been pleased when the teenaged perpetrator of one of the recent lethal stabbings in Jerusalem proclaimed in a Facebook post written a day before his attack that “[the] third intifada is here.” Soon after this attack, Nariman Tamimi shared a post praising the perpetrator as a “martyr” whose memory should be honored. 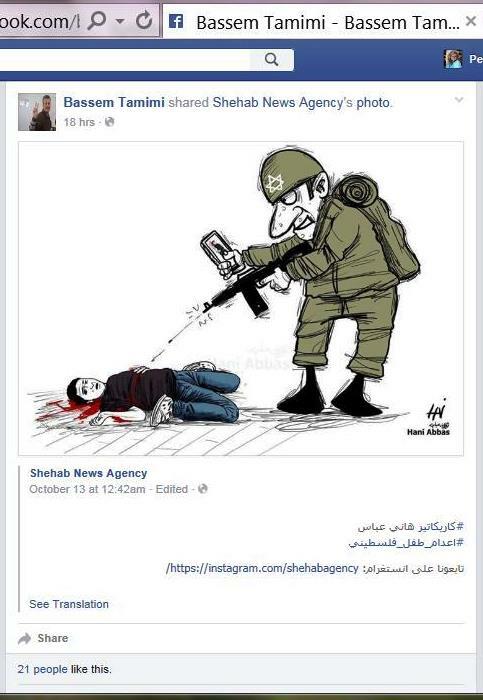 A day later, she posted a cartoon glorifying the attack, which she shared from a Palestinian news site where it was “liked” by more than 14,000 people and shared by more than 1,700. The cartoon misleadingly suggests that the terrorist was targeting a soldier, whereas in reality, he was targeting a couple with two children returning from prayers at the Western Wall. 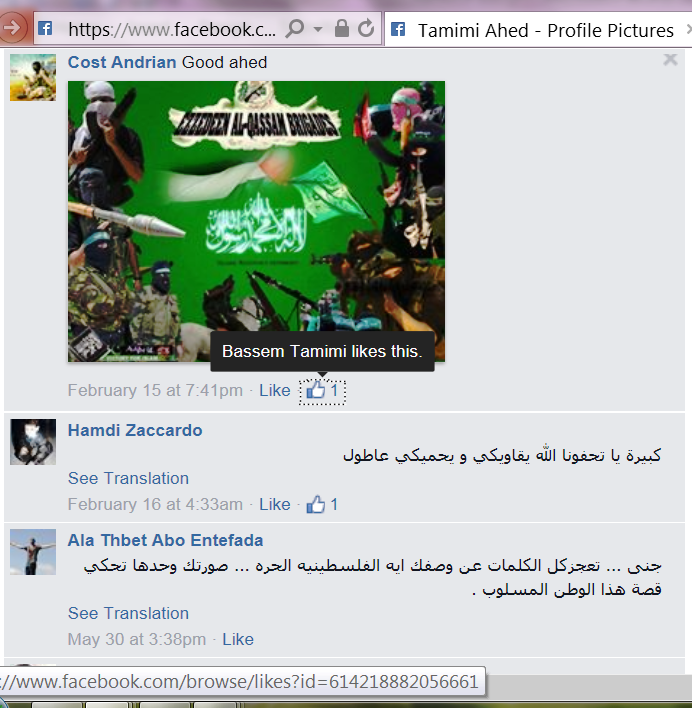 While Bassem Tamimi generally avoids publicly sharing posts that reflect open support for terrorism, some of his Facebook activity indicates that he “likes” the al-Qassam Brigades, the armed wing of the Hamas terrorist movement. Perhaps the most shocking example of his sympathy for Hamas’ terror army is his endorsement of a post promoting the al-Qassam Brigades on the Facebook page of Ahed, the daughter who was received by the Islamist government in Turkey in 2013 with the fanfare of a visiting head of state. Plenty of additional evidence undermines Bassem Tamimi’s image as a dedicated non-violent activist fighting for a just cause. First and foremost, it should be obvious that his persistent refusal to condemn terrorism is not compatible with a commitment to non-violence. But there is also nothing non-violent about the rock-throwing that Bassem Tamimi has long advocated as an authentic reflection of Palestinian “culture and … history.” Bassem Tamimi may pretend that Palestinian youngsters target only well-protected IDF soldiers, but in about one-third of rock-throwing incidents, civilians are the target; sometimes with deadly results, sometimes causing life-long disabilities, and oftentimes causing injury. And is there anything to be proud of if throwing rocks at Israelis is now considered a Palestinian “rite of passage”? Indeed, in the context of the recent wave of terror attacks—many of them perpetrated by teenagers, including one as young as 13—a much more difficult question has been asked in a Ha’aretz column by Rabbi Eric H. Yoffie: “What kind of a national movement unleashes 13-year-olds to do its dirty work? How does a child sacrifice, or at the very least an after-the-fact justification of child sacrifice, bring honor to the Palestinian cause?” But while Yoffie condemned it as “immoral and cowardly for teenagers to be the shock troops for the forces of terror,” the Tamimis have often defended the participation of children in protests and confrontations with Israeli security forces. Bassem Tamimi’s wife Nariman has tried to justify the participation of their children with completely fabricated stories, and Bassem Tamimi has insisted on the involvement of children because this is “their duty” and they “must be strong.” Since Bassem Tamimi obviously believes—or at least would like others to believe—that Israeli soldiers either shoot little children for fun or arrest them to harvest their organs, one can only pity the children who are being told by completely irresponsible adults that it is their “duty” to put themselves in such danger. What message does it send to children when their parents and adult relatives gloat that it is child’s play to “shatter the myth” of an army they usually denounce as frighteningly brutal and trigger-happy? If their long-hoped-for “third intifada” was brought about by knife-wielding Palestinian teenagers stabbing Jews on the streets of Israel’s cities, the Tamimis could see nothing wrong with that. They had always advocated the use of children in violent confrontations with the IDF, and now they were ready to hail teenaged terrorists as “heroes” if they were arrested, and as “martyrs” if they were killed while killing or trying to kill—often claiming at the same time that the “martyrs” were innocent victims executed in cold blood by the evil Zionists. Amnesty International’s decision to feature the Tamimis of Nabi Saleh in 2013 means not only that the organization chose to ignore their ruthless indoctrination of children and their openly stated refusal to condemn terrorism, but there was apparently also no interest in clarifying what the Tamimis actually wanted to achieve with the “third intifada” they hoped to trigger. In his 2011 interview with The Electronic Intifada, Bassem Tamimi asserted that “the reason the army wants to break our model is because we are offering the basis for the third intifada.” But what is this “third intifada,” based on a “model” that relies heavily on children and teenagers trying to provoke clashes with security forces, meant to accomplish? If it is the “duty” of Palestinian children to “resist” and if it is the Palestinian “destiny” to “resist,” what is the purpose of this “resistance?” Surprisingly, neither Amnesty nor other Tamimi supporters have shown much interest in this important question. When asked during the Electronic Intifada interview if he could see “any role for the peace process in ending the occupation,” Bassem Tamimi avoided a direct answer. However, he made abundantly clear how much he disdains “normalization projects” and “dialogue workshops” financed by the European Union and the United States in order to promote peaceful coexistence. He also criticized the approach of Palestinian villages where activists focus their protests on specific local goals like reclaiming confiscated land. In fact, eight months ago the Civil Administration—the occupying authority of the West Bank—was ready to offer the spring back to the village in exchange for an end to the demonstrations. And so gradually the demonstrations acquired a much more ambitious goal: now they aim to bring down the occupation. Once you believe your “destiny is to resist,” it is perhaps impossible to accept an offer which addresses the grievances that supposedly motivated the “resistance” in the first place. The Tamimis opted to reject the offer and to continue their protests, pretending to be motivated by the expropriation of a spring and some land they could have taken back five years ago. So what exactly does the Tamimis’ stated goal of “bring[ing] down the occupation” entail, and what is “the whole occupation” Bassem Tamimi refers to? The Electronic Intifada interviewer didn’t ask for any clarification and perhaps didn’t need any. The interview was conducted by the anti-Zionist propagandist Max Blumenthal, who was then working on a book depicting Israel as the Nazi Germany of our time. Blumenthal clearly viewed Bassem Tamimi as an activist worth featuring sympathetically on a site like The Electronic Intifada, which caters to an audience interested in anything that furthers the demonization of the world’s only Jewish state as the cause of the world’s greatest evils. While the Nazi motto was “The Jews are our misfortune,” the motto of today’s anti-Zionist activists is “The Jewish State is our misfortune.” Get rid of the world’s only Jewish state, and the world will be a better place. We must kill the occupation and the [sense of] separation in the Israeli consciousness: The separation of people from one another is a question of consciousness. We must never return to this failed pattern of thinking. The future will not change if we continue to think with the same concepts of the past. The solution is a single state. The goal of the Tamimis’ activism is the elimination of Israel as a Jewish state—and Bassem Tamimi had spelled this out very clearly by the time Amnesty announced its support for the Tamimis and their village at the end of 2013. Amnesty International may feel itself justified in designating Nabi Saleh a “community-at-risk,” but the risk is largely a consequence of the Tamimis’ longstanding quest to trigger a “third intifada” in order to eliminate the Middle East’s most successful modern state. It is shocking to see that this is a goal Amnesty apparently deems worth supporting. 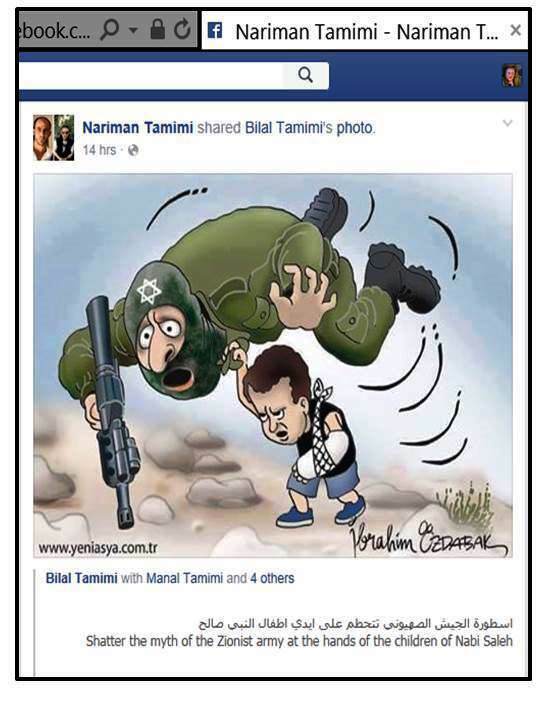 Moreover, while the Tamimis may pay lip service to non-violence, their social media activity shows all too clearly that they harbor intense Jew-hatred and that they are only too willing to glorify and incite murderous terror attacks. With Israelis now living with the hourly fear of random knife attacks, car rammings, bombings and shootings, the virtual hatred pushed by the Tamimis and their allies has become frighteningly physical. Is it too much to ask that human rights organizations like Amnesty International avoid supporting activists who deny the basic humanity of Israel’s Jews? And has it really never occurred to those who support the Tamimis that there would be no clashes in Nabi Saleh, and no reason to regard the village as a “community-at-risk,” if the Tamimis devoted their efforts for a “third intifada” into constructive efforts to build political support for the peaceful co-existence between a future Palestinian state and the Jewish state of Israel? If this seems an unrealistic solution in the current circumstances, the enthusiastic and unquestioning support of western liberals for those, like the Tamimi clan, whose mission is to prevent exactly this outcome, is one critical reason why. Note: I would like to thank Ibn Boutros for volunteering his time and expertise to research social media posts in Arabic and provide translations. I am also grateful to Arnold Roth for sharing the knowledge he has acquired over years of blogging about the Tamimis after losing his daughter in the Sbarro bombing of 2001. All social media activity cited in this article is documented in screenshots and webpage archives; screenshots are dated Israel time.